Website development for the Hospitality Industry goes beyond building a beautiful website. 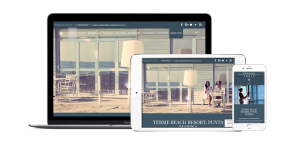 At Xenia Lab International, we listen to the Client’s needs and select cutting-edge softwares and technologies to drive revenue to leisure resorts such as Terme Beach Resort. We create websites and deliver digital strategies with solid foundations and long-term benefits. To drive online traffic, engagement and revenue. Many hotels underestimate the untapped potential of their brand.com identity and lack strategic elements to prompt users to engage with a website. At Xenia Lab International, we focus primarily on the hospitality industry for our founding Partners and Production Team have worked in hotel operations for many years. So we have a deep understanding on consumer behaviour – and that of hotels owners as well. Our websites match conversion-focused goals, SEO techniques and practices, analytics monitoring and content management, to deliver a tailored experience. If you are looking for a simplified, more affordable option check out our Ready-Made 360hotel.co Website Solution.